Competitors meet one-to-one in each round, and are paired based on approximately how well (or poorly) they have performed so far. The winner is the player with the best score at the end of the tournament. If the top two players are tied for their score, a final tie-breaker match will be conducted. 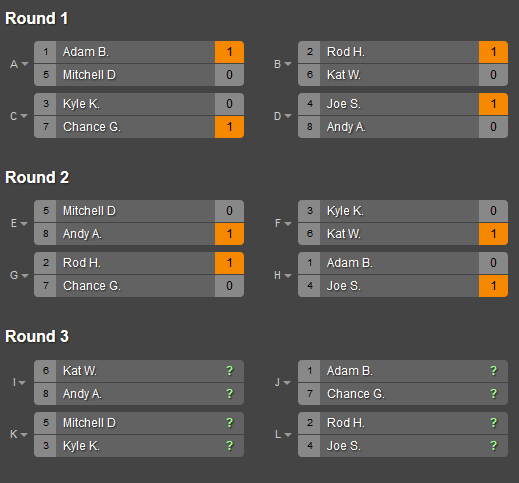 If the top four players are tied for their score, the players take part in a single-elimination bracket to determine the winner. 2. Players that register must submit their name, Trainer name, and Friend Code, which will be posted for all participants. 3. Each match between players will consist of three games. Best two out of three wins the match. --The loser of each match reports the result of the match to Devin. 4. Participants can change their team at any time between games. 5. If a player is unable to meet a challenge within a week of being matched up with an opponent, they will be considered to have lost that match. 1. No Legendary Pokémon are allowed. 1. Each Pokémon on a player’s team must be of a different species or Natdex number. 2. Each Pokémon on a player’s team must be holding different items. 3. If a player’s final Pokémon used Selfdestruct, Explosion, Destiny Bond, or Final Gambit, and both players’ final Pokémon faint as a result, the player who used the move loses that game. 4. If a player’s final Pokémon used Double Edge, Volt Tackle, Flare Blitz, Take Down, Submission, Brave Bird, Wood Hammer, Head Smash, Struggle, or Wild Volt, Head Charge, or was holding Life Orb, and both players’ final Pokémon faint as a result, the player who used the move wins that game. 5. If both players’ final Pokémon faint due to damage from a status condition or a weather condition, such as Hail or Sandstorm, the player whose Pokémon faints last wins the game. This includes the effects of Perish Song. 6. If a Pokémon’s Ability (such as Rough Skin, Aftermath, Liquid Ooze, or Iron Barbs) or held item (such as Rocky Helmet) results in each player’s final Pokémon fainting, the player whose Pokémon had the Ability or held item wins the game. 7. For matches between X/Y and Omega Ruby/Alpha Sapphire, items introduced in OR/AS (including Mega Stones) are not allowed.